Quite simply, if you're looking for the most dependable hydraulic boat lift available at the most competitive price, you want Summit Marine. Our boat hoists for sale aren't like everyone else's. Rather, we offer the kind of high quality products you won't find in any other store. 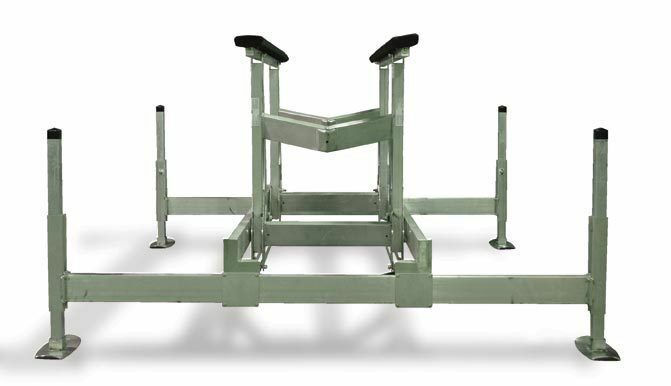 Sold with a 10 year parts warranty, a lifetime frame warranty and an easy buyback policy, we want to be your headquarters for hydraulic boat lifts that last and last. Check out our convenient, attractive docks too! Combining an aluminum boat lift with the power of a hydraulic engine and a safe 12 volt motor, we knew we were onto something special when we created our first hydraulic boat hoist in the mid eighties for our own watercraft. In time and with many refinements along the way, we turned our exciting new product into a company in 1989 with the introduction of the Genesis Sea Lift and Summit Marine. Today, our innovative boat hoists are used by customers worldwide. With safe power, total portability and simple assembly, we sell the hydraulic boat lift that experienced boaters prefer. With lesser imitations now on the market in response to our success, only our reliable, safe and convenient boat hoist has become a legend within the marine products industry. 1979 Viking Double Cabin Motor Yacht This Viking 43 Double Cabin Motor Yacht has nothing left to upgrade! If you're ready to step aboard and cruise or live aboard in style and comfort this two stateroom, two head boat is for you. The meticulous owner has upgraded all the systems on the boat to make her a joy to own and operate. 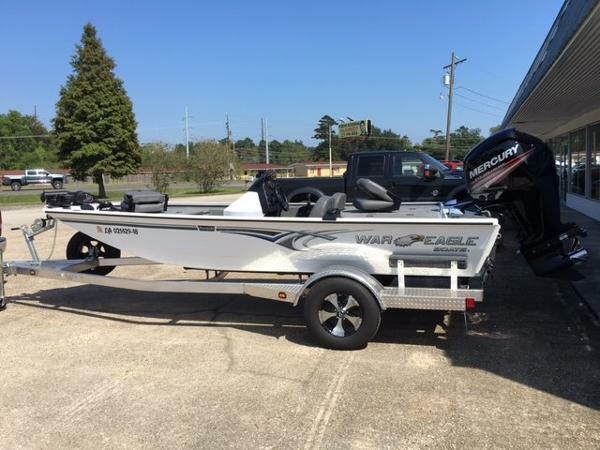 The list of new equipment and upgrades is staggering and includes; (2) new Garmin integrated touch screen color monitors (2010) New Onan/Cummins generator (2011) with new aluminum fuel tank and separate battery (2) new Marine Crusair units (2011), three zone, with reverse air for heat New Isotherm stainless steel dual voltage refrigerator and range (2011) New Saniflush head system in aft master head (2011) Rebuilt windlass (2011) rebuilt and rechromed with two new footswitches on deck and remote at helm, new freshwater washdown and 250' of all chain rode (2) new main water pumps for the super clean, reliable Detroit 671 motors. all filters have been converted to the new cartridge style for ease of maintenance (both fuel and oil). starboard motor has 5 hours on a new heat exchanger. New Reverso oil change system installed in fall of 2012. all fresh fluids throughout vessel. (2) new VHF antennas (2012) New 50 amp battery charger (2011) (2) new batteries (2012) with two new battery switches New 7 gpm house water pump (2012) (3) flat panel tv's with ipod docks New canvas (2010) with isenglass on flybridge and double slides for easy opening New aft deck and helm carpet (2011) Spare shaft in engine room Set of spare 4 blade nibral props This galley down aft deck motor yacht has generous headroom and a roomy all teak interior with LED lights in the salon and aft cabin. As a Viking you know she has a well earned reputation for quality construction and excellent sea keeping abilities. She is spacious, comfortable and very well equipped. 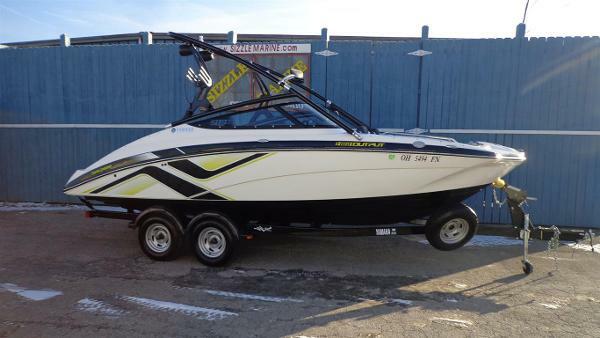 The owner has invested over $150k in improvements since buying the boat. 1993 Hunter Passage 42 - PROTEUS Set up for serious off-shore passage making and fully self-sufficient off-the-grid cruising. Has recently (beginning 2014) sailed in England, the coast of Europe and the western Med (2015) and crossed the Atlantic to the Caribbean (Nov 2015). Came up through the Caribbean (spring 2016). This yacht was never chartered, always privately owned, and meticulously cared for. All servicing and installations were done to a high standard. All safety equipment is up-to-date. The yacht participated in the ARC (Atlantic Rally for Cruisers) which requires a high standard of safety equipment, training, and inspections. The yacht has been certified as a Class-A offshore sailing yacht. All documentation is available and will be conveyed to future owner. 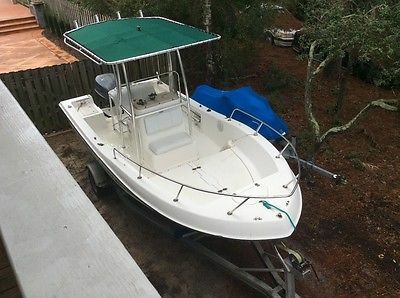 The previous owners lived aboard, loved every minute of it, but are now moving back on land for a few years and do not want the boat to sit and atrophy. She needs to go to a good home and to someone who will continue the journey! She has taken care of her owners for years and will continue to do so for many years to come. S/V PROTEUS is "overbuilt" and designed for extended offshore passage-making and off-the-grid cruising. Just want to jump all the way down to the USVI instead of going the super-slow way all the way through the Bahamas? Okay. The previous owners just made a passage from the Dominican Republic straight to Ft.Lauderdale (March 2016). Seven days offshore? No problem. PROTEUS has a thicker hull, reinforced rigging, extra backstay (B&R rigs normally don't have them). Massive solar panels, watermaker, genset, wind generator – all these advanced features make for a yacht that can go anywhere, do anything, and actually be comfortable while doing it. The solar panels were upgraded in 2015, and the owners report that they lived entirely off the solar panels and almost never used the generator while underway. Occasionally, you'll hear people scoff at production yachts for being only for "coastal" cruising. "Oh, I'd never cross an ocean in that!" Not the Passage 42! Did I mention she's cruised in the North Sea and English Channel recently? When there were only aluminum-hull Ovni's and other "extreme" sailboats and expedition yachts at the docks, PROTEUS was right in there with the best of them. All image were made in June 2016 except the two exterior shots, which were made in Spain and Gibraltar in June 2015. More photographs are available on request. Here is an interior walkthrough. Copy link: Interior Walkthrough Specifications: Rig: Isomat spar with (factory modified) B&R rig (additional backstay and reinforced staysail) Rig has recently been professionally surveyed/adjusted after Atlantic crossing. LOA: 42ft 6in / 12.9m Beam: 14ft / 4.27m Empty displacement: 20,500lbs / 9299kg / 10.25 tons Ballast: 7900lbs / 3583kg / 3.95 tons Keel: lead wing Mast height from waterline: 60ft 6in / 18.44m (Intracoastal Waterway: yes) Draft: 4ft 11in / 1.49m Theoretical hull speed: 8.3 knots (2015 Atlantic crossing, Cape Verdes to St.Lucia: 13 days) Capsize ratio: 1.94 Auxiliary power: 63hp Yanmar 4-JH2TE diesel, direct drive, dripless packing glandEngine Hours: total hours (approx) 3300 (less than 400 hours since last major overhaul by Yanmar certified engineer) Twin custom stainless steel sail arches, with dinghy davits Oversized bow-thruster (was intended for use in tidal areas)Bottom was painted in Summer 2015, but will need new bottom job soon. (Will include bottom job for purchase price.) Hardware: Barient 40 sheet winches (x2) Barient 32 halyard winches (x2) Harken ESP Type 2 furling gear (new 2015) mix of Lewmar & Harken blocks(These Barient winches are designed to be low-maintenance.) Tanks: Water: 150 gallons / 568 litres Fuel: 72 gallons / 265 litres Blackwater: 26 gallons / 98 litres (w/ macerator pump-out) Greywater: 5 gallons / 19 litres (w/ overboard pump) Navigation/Comms: Raymarine AIS-650 (collision avoidance)Raymarine Radome RD418D digital radar antenna (integrated to MFD at helm) (new 2015) Ritchie Binnacle compass ICOM M505 DSC marine VHF radio Raymarine ST50 depth, wind speed/direction, log ST7000 Autopilot (linear drive) ST4000 Autohelm (backup, needs service) Raymarine E80 plotter (SeaTalk integration throughout) Firdell Blipper radar reflector (permanent mast mount) Autohelm 600 Nav-center GPS (included, working but not used) Raymarine SL70 radar display (backup, included, working but not used) KVH satphone/tracphone/v-SAT (included in sale, but not installed - owners preferred hand-held SATphone) Furuno 207 WeatherFAX (paper print-out, extra paper included) Sail Inventory: Main: Dolphin Sails UK full-batten, 2 deep-reef (2013) Genoa: Dolphin Sails UK 105% furling genoa (2013)Staysail: UK Sails #4 heavy jib (2015) (ideal for heavy-weather sailing) Dolphin Sails custom LazyJack system Double-line reefing system All halyards/lines/sheets replaced October 2015Rigging in place for asymmetric spinnaker or parasailorRig-rite spinnaker car on mast track (2015)Spinnaker/whisker pole for downwind sailing (new 2015) Anchoring: 50m chain (likely needs to be checked) Lofrans Progress1 electric windlass Fortress anchor Aft-mount rope spool Entertainment: 32-inch plasma television (main salon) 17-inch LCD television (master cabin) Sony DVD player and Dolby 5.1 surround sound (w/ subwoofer) Pioneer radio/Bluetooth head-unit, speakers throughout and on traveler arch (new 2015) Safety: Plastimo SOLAS 4-man life raft ISAF/RORC flare packs (in date) ACR Satellite 406 EPIRB (registered 2015) High-flow electric bilge pump (new) with backup Manual 30gpm diaphragm bilge pump Fire extinguishers (some recently replaced 2015) Winchard jacklines on deck Electrical: Victron BlueSolar 140-watt solar panels (x2 = total 280w/17amp) SunForce Air-X 400-watt wind generator (serviced regularly) Kohler 8kW generator (needs servicing soon) Heart Freedom inverter/charger 120v/240v-50Hz/60Hz transformer (any power input okay: European/Caribbean/US/UK)50ft shore power plug with adaptors Interior Amenities: Gimbaled LP gas stove/oven Electric toilets (master stateroom is new 2015) Webasto ducted heat (serviced Winter 2014) Air conditioning (rebuild 2013) Dickinson Newport diesel heater (needs new diesel pump) Katadyn PowerSurvivor 80E water maker (4-6 g/h) Fridge Deep freezer Master Stateroom: Centerline bed, lots of storage, independent air conditioner unit, vanity, port settee. Master head: electric toilet, separate tub/shower with seat. Forward stateroom: Oversized centerline V-berth, vanity, hanging locker, and storage. Forward head: electric toilet and shower with independent sump. Dinghy:Zodiac 2.6m RIB. Engine not included (sorry, someone bought it already). 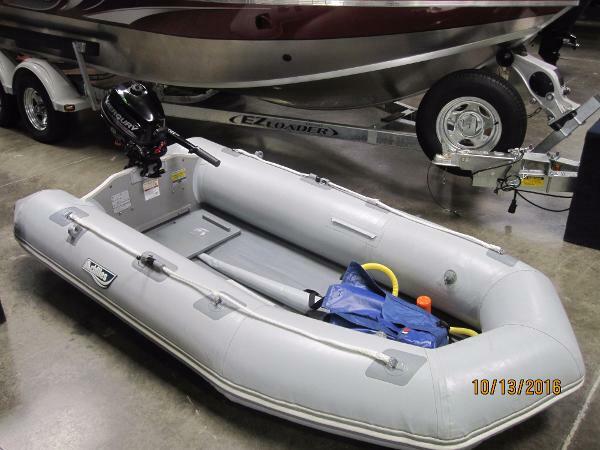 Dinghy included purchase price. Known Issues:–The canvas cockpit enclosure will need to be replaced soon. It is at the end of its usable life. Sale price adjusted for this.–Bottom paint and standard bottom maintenance needed soon. Will include bottom job with sale price.–Kohler 8kw genset needs servicing soon.–House batteries need checking for possible replacement. 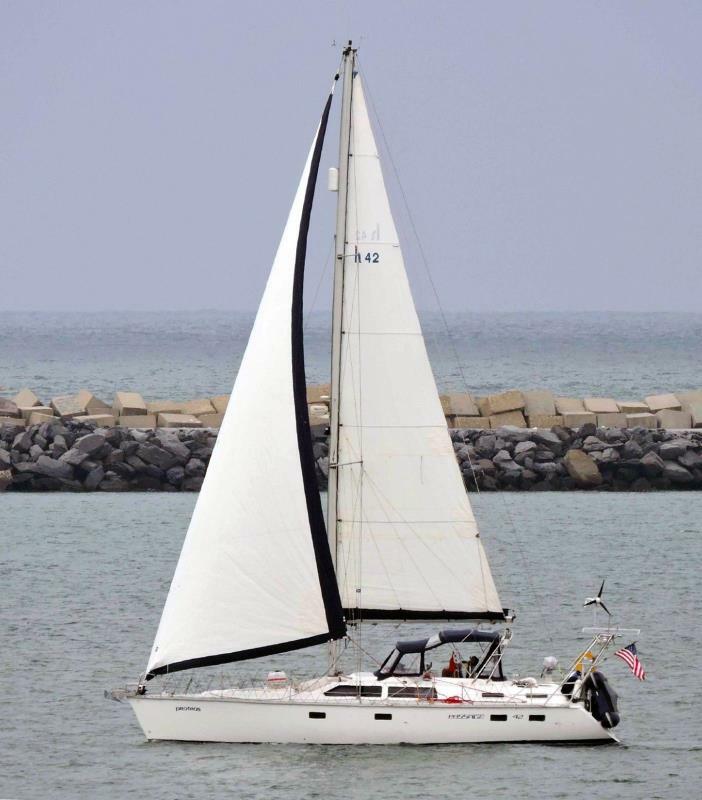 Sale price adjusted for this.–Anchor rode has some age on it. 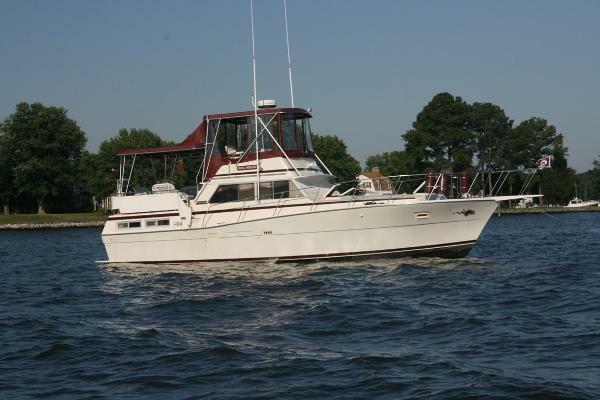 Needs checked and/or replaced before extended use.–There is a slight rust stain on the starboard aft deck. Additional Details:This yacht is currently in storage for hurricane season and the winter, but can be made ready for viewing. Sea-trial with security deposit (refundable). PROTEUS is on the coast of Georgia. Arrangements can be made for delivery within a reasonable distance on the US East Coast. Arrangements will be made to assist the Buyer in learning all of this yacht's systems. 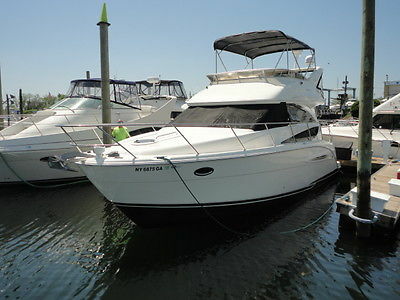 Current owner offers contact for any questions after the sale of the yacht. Final Thoughts from the Owner:We truly love this boat. Because of our time on PROTEUS, we will never be the same. Everywhere we go and everything we do for the rest of our lives will be colored by our experiences sailing this yacht. And it's not like we're ridiculously rich – we did everything on a modest budget, mostly on savings – but we did it, and you can, too. If you were looking for a chance to cut the lines and live like you always dreamed, PROTEUS could be that chance. It was for us. England, Ireland, Gibraltar, Morocco, half the islands in the Caribbean... it was all in reach, just outside the window. We look back on it now and think: "What on earth did we just do!?!" But we did. PROTEUS took us there. She'll take you there. Disclaimer:The details of this vessel are offered in good faith but cannot guarantee or warrant the accuracy of this information nor warrant the condition of the vessel. A buyer should instruct his agents, or his surveyors, to investigate such details as the buyer desires validated. This vessel is offered subject to prior sale, price change, or withdrawal without notice. 2014 Achilles LEX-96 LEX tenders represent the culmination of many subtle refinements over the years that have kept them technologically current while maintaining their traditional appearance. A sleek bow design and ample interior space come together in this classic tender. A teardrop rub strake deflects spray when planing and improves protection from the inevitable collisions with docks and boat hulls. 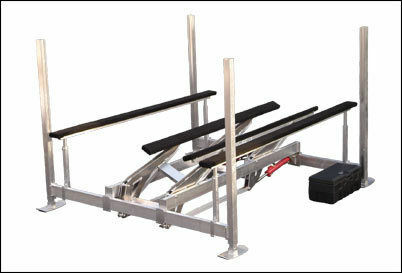 Other subtle quality features range from an adjustable range wood seat to molded rubber oar holders. 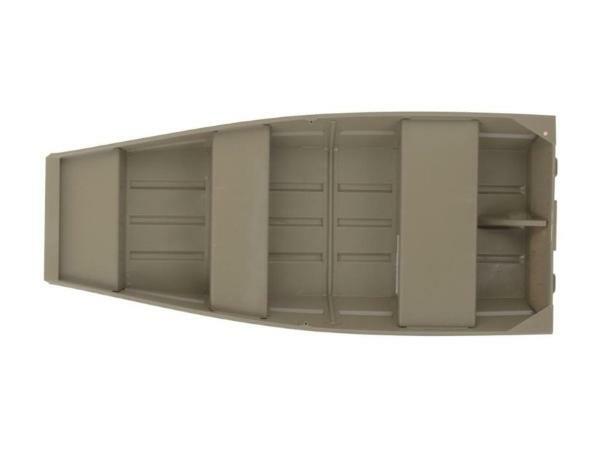 They all add up to a solid, reliable tender that combines practicality and performance in an economical package.LEX Standard Features include: Hypalon/Neoprene reinforced fabric; self-locking wood floorboards; fold-down, locking oar system with oar holders; aluminum oars with removable blades; full-length tear drop rubbing strake; removable wood rowing seat; carry bag; foot pump; towing bridle D-rings; protective transom motor clamp plate; life lines; maintenance kit; and self bailer valve. 2008 Back Cove 29 The style of the Down East lobster boat has been closely associated with Maine's proud boat building heritage. The Back Cove 29 is a most recent example of everything that makes the Down East lobster boat a work of art. She has a traditional spoon bow and her transom is gently sloped: a style that will turn heads in any harbor she enters.Below the surface she is modern and contemporary. A deep-vee hull with prop recess and standard trim tabs offers comfort and performance. With her standard 260 horsepower 6 cylinder diesel, she will cruise at 18 knots and top out at 23, and with the optional 315 horsepower, 6 cylinder diesel engine, she reaches a top end of 27 knots and will cruise very comfortably in the low 20's. Around the docks, you will appreciate the maneuverability provided by her standard bow thruster.Available with an optional Hard Top or standard as an open express with aluminum wind shield, the Back Cove 29 is practical and beautiful. She is a delight to drive and a joy to behold. 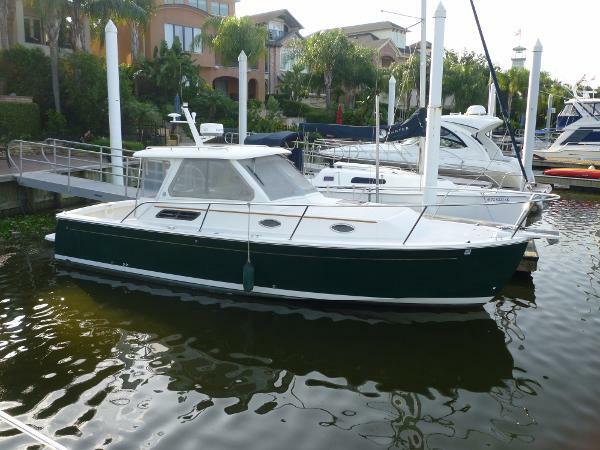 1979 Viking Yachts Double Cabin Motor Yacht This Viking 43 Double Cabin Motor Yacht has nothing left to upgrade! If you're ready to step aboard and cruise or live aboard in style and comfort this two stateroom, two head boat is for you. The meticulous owner has upgraded all the systems on the boat to make her a joy to own and operate. The list of new equipment and upgrades is staggering and includes; (2) new Garmin integrated touch screen color monitors (2010) New Onan/Cummins generator (2011) with new aluminum fuel tank and separate battery (2) new Marine Crusair units (2011), three zone, with reverse air for heat New Isotherm stainless steel dual voltage refrigerator and range (2011) New Saniflush head system in aft master head (2011) Rebuilt windlass (2011) rebuilt and rechromed with two new footswitches on deck and remote at helm, new freshwater washdown and 250' of all chain rode (2) new main water pumps for the super clean, reliable Detroit 671 motors. all filters have been converted to the new cartridge style for ease of maintenance (both fuel and oil). starboard motor has 5 hours on a new heat exchanger. New Reverso oil change system installed in fall of 2012. all fresh fluids throughout vessel. (2) new VHF antennas (2012) New 50 amp battery charger (2011) (2) new batteries (2012) with two new battery switches New 7 gpm house water pump (2012) (3) flat panel tv's with ipod docks New canvas (2010) with isenglass on flybridge and double slides for easy opening New aft deck and helm carpet (2011) Spare shaft in engine room Set of spare 4 blade nibral props This galley down aft deck motor yacht has generous headroom and a roomy all teak interior with LED lights in the salon and aft cabin. As a Viking you know she has a well earned reputation for quality construction and excellent sea keeping abilities. She is spacious, comfortable and very well equipped. The owner has invested over $150k in improvements since buying the boat. 2013 Sealegs 7.1m RIB PRICE SIGNIFICANTLY REDUCED! MSRP: $149,500. Included is a transferrable factory warranty. 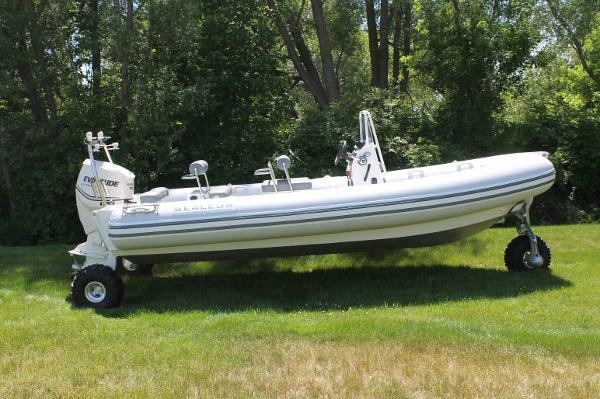 This Amphibious Sealegs has been lightly used as a demo boat for two short summers and barely has any hours on its outboard and inboard engines. The land to water or water to land transfer is unlike anything else you will ever experience in boating. Powered by the 150 Hp Evinrude E-TEC, the all aluminum hull with Hypalon tubes insures an exceptional ride on the water and can achieve speeds of up to 48 MPH. This vessel is first and foremost a great boat that happens to be able to climb out of the water all on its own! On land, the craft can travel up to 6 MPH. Great for people without docks. Imagine the possiblities for your family's use! A custom drive-on EZ-Loader trailer is also available for purchase for long trips and storage.